Notice: -The company who were manufacturing/selling this product seems to have disappeared. Their website is no longer active and they haven't responded to email contacts. I can only assume they've gone out of business. I've left their information here in case anyone is interested. One of the great problems with using a wheelchair or scooter as a mobility device is transporting it from place using a vehicle. Many people don't want to buy a van and most cars are not large enough to easily transport mobility devices. For those who do own a van, they may have to remove a needed seat to load their wheelchair or scooter into the back. If they have the room they still may require a mechanical lift to load their device. For those with a car, it's unlikely and power mobility device will fit into its trunk. The only option is a rear carrier that is mounted to the rear of the car and these carriers are not suitable for many models of cars. 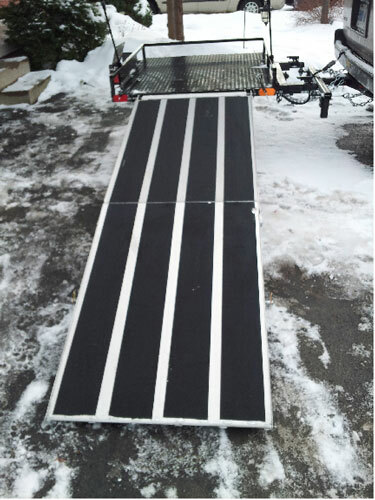 The Handiback Wheelchair/Scooter Trailer has a unique design that allows mobility devices to be carried behind almost any vehicle that can accommodate a class II or III hitch receiver without putting a lot of burden on the suspension of the vehicle. 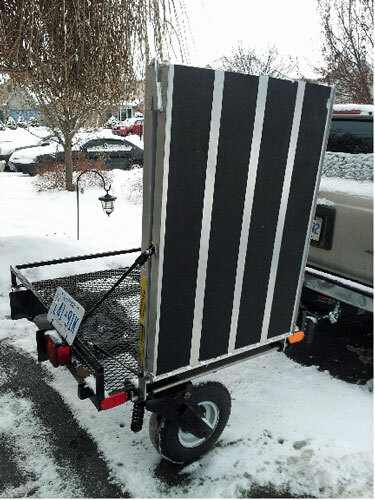 These trailers incorporate a unique double trailer hitch design that prevents the trailers from swiveling behind the vehicle and allows the vehicle to be backed up without the problem of jackknifing. Unlike most trailers, the driver does not have to steer in the opposite direction to make the Handiback trailer go the direction they want. 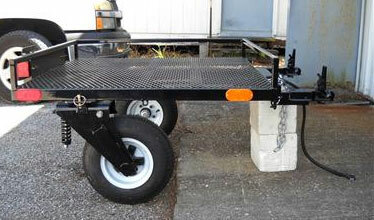 Handiback trailers have wheels that swivel, much the same as casters on a wheelchair, that make the non-jacknifing and normal steering possible. 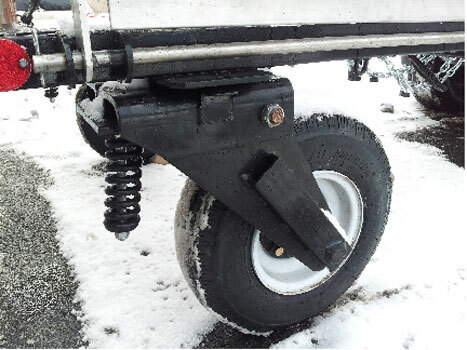 The Handiback trailers include a hitch adapter to allow the double hitch design to be used with common hitch receivers found on many vehicles. 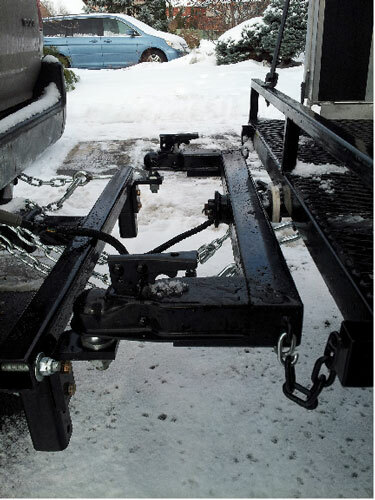 The hitch adapters allow for some height adjustment of the hitch balls (not shown) and will fit into standard vehicle class II or class III hitch receivers. Each trailer is inspected at time of shipment and is guaranteed to be in good working (new) condition. We make an effort at time of sale to determine the intended use of the trailer and the kind and type of vehicle that will be used to tow the trailer. It is the purchaser's final responsibility to adapt the trailer to the vehicle. Note: Contact information no longer seems to be active.